I needed some small nightstands for a small bedroom, and these are perfect! I wanted a feminine white piece of furniture and these are so lovely in my little girl's room. Thanks Overstock! Designed to evoke traditional style with a modern edge, the Aldine accent table from iNSPIRE Q® is a versatile addition to any living space. The unique oval shape makes this piece visually appealing and is constructed from Poplar wood. Two ample storage drawers with wooden glides feature French dovetail drawer construction. The storage makes this piece an excellent companion for your bedroom set, or even in the entry way. These tables are so cute. They are pretty good quality. The drawers are all wooden with a wooden track in the middle. There is a plastic piece on the bottom of each drawer that keeps you from pulling it out too far. The drawers fit smoothly into the front of the table. I ordered two of these tables and they arrived already assembled, but the packaging was terrible and they were both a little damaged. Looks like they were dropped or something heavy dropped on them in shipping. One was salvageable with just a slight ding on the edge, the other was pretty noticeable on the top and edge so I returned it. Overstock immediately sent me a new one. The new one was sent in the original packaging, unassembled. Assembly was really easy. All hardware was included, and it took me about 10 minutes to put the legs and knobs on and move everything around. The original two were already assembled but the bolts holding the legs on needed tightening. You will need an Allen wrench to tighten them. Oh, the bottom of the table where the legs attach is completely open. Some people may want to know that. 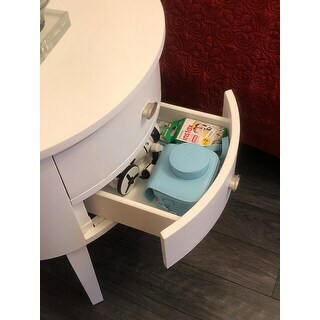 I like it because I can run my chargers up into the drawer and keep my kindle and other electronics hidden in the drawer without cords all over the place. I ordered the dark wood color. It looks really nice. The replacement table I got seems to be SLIGHTLY darker in color, but it's not really noticeable on either side of the bed. Overall this was a very good purchase and Overstock customer service has been great. 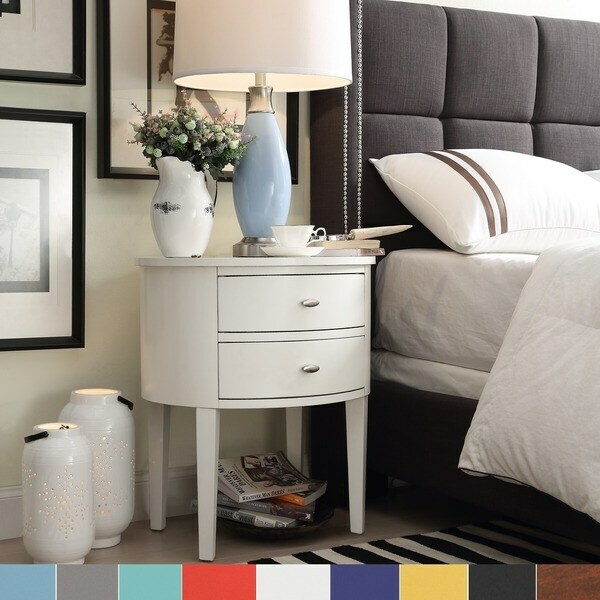 Love the look and the color of this nightstand, however I don't feel the quality is quite as good as most of the inspire Q pieces I have bought. Chips rather easily after just a short while. This was the first of many products I've recently purchased from Overstock and I couldn't be happier with the quality and value of the product. 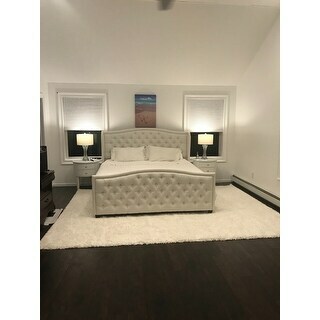 It was the perfect size and color for our bedroom and I was surprised at how nice it was, far better than I expected for the price. I actually bought two of the neo ovals in two different styles, this one plus the Neo Oval Accent Table. They were easy to assemble and look wonderful in the room. In fact, I was so happy it has encouraged me to purchase many other pieces for the house. Four defective nightstands...had high hopes! I ordered two of these back in February and LOVED them. The size and style were exactly what I was looking for and could not find anywhere else. 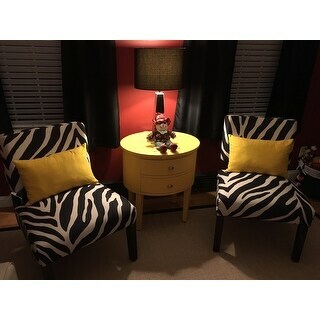 These were used as matching nightstands on either side of our master bed. I never was able to open the drawers of the one on my side of the bed, however they did work on my husband's side of the bed. A few weeks into having them, we moved the nightstand less than a foot and it collapsed! The leg ripped right off. It was completely screwed in...still a mystery to me. My husband fixed it but it was short-term. I wrote in to Overstock and a CSR on in their live chat offered two free replacements if we returned the items. They shipped out two replacements, and after assembling them over the weekend, we dis-assembled the two originals, and packaged them up in the boxes that brought the replacements in. We carried the new ones up to our room. BOTH are unstable and wobbly. SO disappointed! They look nice, but in order to use practically (our lamps, hold of a glass of water, etc. ), we'll need to stabilize with something underneath the leg of the nightstands. This would be visible. Today I had to file for another return. Apparently I'll receive a full refund but I'm incredibly disappointed. I'm not sure I'll buy from Overstock again. These were four defective product items and it's a hassle to assemble/dis-assemble. I also have to go find and buy two LARGE boxes to fit the replacement nightstands in. Now we will be without nightstands until we determine a solution... These were lovely, but to be safe, I would not invest in the hassle or spend the money based on our experience...good luck! 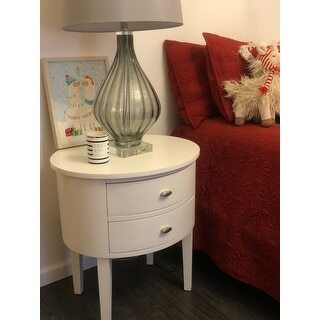 We purchased two of these to use as bedside tables. They are very sturdy and look great! The drawers work nicely! We are very happy with this purchase. Shipping was super fast and they were easily put together! I received two of these drum-style night stands. The first one out of the box looked like it was really going to be a nice piece. However, the drawers were not centered on the long side of the oval. They were partially on the long side, partially on the short side. Then when the legs were attached, it looked like the Three Stooges built it. I could tell it was already returned by someone else for the same reason. I didn't even open the second box--wasn't going to bother after having the repack the first one for shipment back. Customer service was very easy though and pieces were picked up the next day. At first, I only got a refund for one of the tables. I had to call back for correction in getting refund on two tables. Again, customer service was good. The piece had nice drawer handles and the wood was finished very well. It just wasn't built correctly. I hated sending them back. They could have been the perfect pieces for what I needed them for. I probably won't buy more furniture online. This is a structurally attractive piece of furniture. The design is unique and works well, adding to my bedroom decor as a night table. The color is rich and looks like one paid a high price to acquire it. The drawers are small but does not take away from my satisfaction. Overall a stunning piece-no regret. I am very happy with my purchase. I got the white one, and it looks great with my set up. 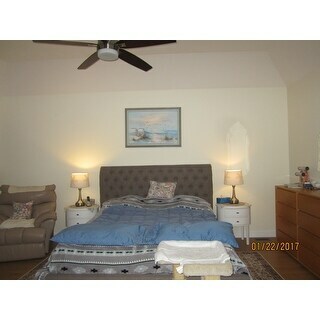 Description of dimensions and color is spot on, and it complements my decor nicely. The only comment that I want to make is that there were some scratches on the side and draws,but nothing too noticeable, but “I” know they are there. The packing was good, even though it did look like one of the boxes had been opened before. I recommend this tables to anyone looking for a chic addition. Quality is worth the price. I love theses tables. I really love the oval shape of the tables, they are very elegant and classy. The quality is good, all wood construction. They look beautiful in my bedroom. I was very happy with this purchase and would recommend it to a friend. Overall, I am satisfied to the bedside table, quality is very good, I like the wood material. The oval shape gives the table a modern flair, but the simplicity lends a classic look. Looks wonderful beside the bed. Plenty large enough for a lamp and a vase or other decoration. This little table came together so easily. I'm a 68 yr old grandma and it took me a whole 20 minutes. So easily. I got the yellow one and my room is filled with sunshine all the time now. I hunted and hunted for this table and so glad I found it on Overstock. I was afraid it might be too small to hold a table lamp but there is plenty of room. The drawers are the perfect place for remote controls and glasses. This side table was true to color and very stable. It was easy to assemble and really adds to my bedroom decor. The drawers are a good size for storage and the pulls not only look nice but are functional as well. Love these. Well made. What little assembly required was very simple. One was damaged during shipping but overstock was very quick to replace it. No hassle! I LOVE THIS LITTLE TABLE!!! It is a bit larger than I imagined, but it totally works for the space. I got it in red and it is perfection. So easy to put together, I did it myself in no time. Very happy with this purchase! I love this bedside table. It added the perfect amount of whimsy to my daughter’s bedroom. It is sturdy and appears exactly as pictured. Another Overstock win for me! had bought my 1st one a few years ago and was pleasantly surprised to find it again -thank you! Just got these and were easy to assemble. Needs an extra washer on the drawer pulls to keep from wiggling. 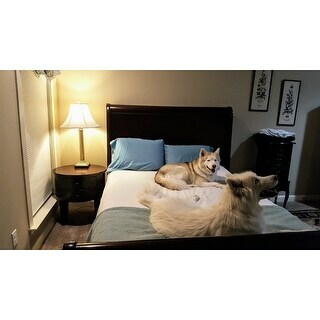 They look just right in our bedroom. Lovely, stable table with handy drawers. Easy to put together ... only legs to put on. Very nice accent to my living room. I bought the dark brown ones. They look much more expensive than they were. All we had to do was attach the legs and and handles. The drawers open and close easily. "Is Espresso available.....I would like 2"
Yes, the espresso option is available. "IS THE WHITE COLOR A TRUE WHITE OR AN OFF WHITE ?" In my opinion, the white is a true white. It is is very true white I am pleased with it. "I do not see that white is available. When will white be available? " The white option is currently out of stock. It is expected to be back in stock in late February. "I don't see red available to purchase. When will it be available. " The red option is currently available. "Is the Yellow table a bright lemon yellow or a creamy yellow. It is hard to tell from the pictures." Color is subjective and may appear differently based on monitor settings. In my opinion the yellow is a brighter color with some orange undertones. "What are the dimensions of the table?" This table measures 23.8 inches wide x 20 inches deep x 26 inches high. "Is there a dresser or armoire that matches this night stand in white?" No, we do not currently offer a matching dresser.